Glenfall House commands a spectacular location on the south-west face of Harp Hill in Charlton Kings, Cheltenham. 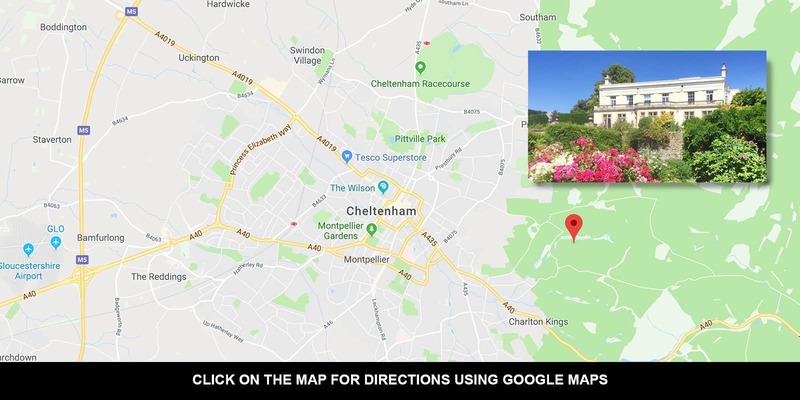 From Cheltenham and the A40, head towards the Battledown area of Prestbury on the B4075 until you reach a double mini-roundabout. Take the right fork at the cream coloured building to climb Harp Hill. Nearing its summit you will have amazing views on the left of the whole of Cheltenham. The road levels off with a tight bend to the left with a signpost pointing to Charlton Kings, DON'T take this road. Continue ahead and take the next right into Mill Lane opposite the green railings. After a short distance the main gates to Glenfall House will be straight ahead of you. Follow the picturesque driveway through the woodland, over the stone bridge, following the sharp bend to the right. Reception parking is available outside the main doorway of Glenfall House. Two alternative routes are also available from Charlton Kings. Enter Glenfall Way from the A40 to climb Ham Hill then take a left fork at the triangular green into Mill Lane. After several bends in the road the Glenfall House gates are on your right hand side. The Six Ways junction at Charlton Kings offers the best route when the weather is icy. Follow Greenway Lane to the end and turn right and right again into Mill Lane where the gates are straight ahead. Please be aware of sharp bends on these routes and care should be taken during frosty weather. Large coach, stretched limousine and Hummer bookings need to be cleared with Glenfall House due to the tight bends on the driveway.